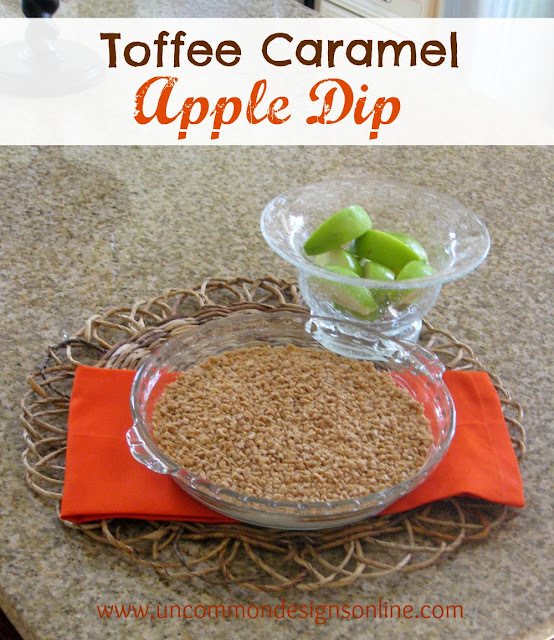 Toffee Caramel Apple Dip - 4 Ingredients! Did you catch our Tailgating Ideas post yesterday? Well, as promised, I am back today with a super quick and easy recipe. This is a staple in our home for parties, tailgating, drop-ins, you name it! 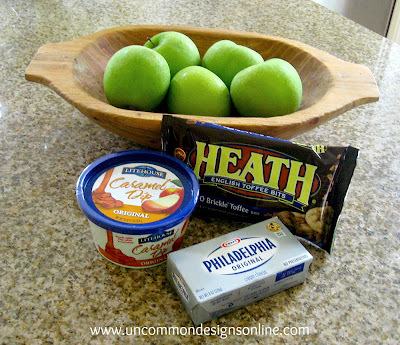 The combo of apples and caramel is a hit with everyone and it is so easy to make and transport! This recipe is so simple, it involves 4, yes only 4, ingredients! Sweet! Need a last minute appetizer to take to a friend’s house or a school event? Then this is the one for you! Allow cream cheese to soften a bit, and then simply spread it out on the bottom of a shallow rimmed dish. I use a glass pie plate. Pour out the caramel dip on top of the cream cheese and spread out. Do not mix in with cream cheese, just spread out on top. TIP: you may need to zap the caramel dip with the top off in the microwave for a few seconds to soften it up. Finally, sprinkle the toffee bits all over the top of the caramel. Slice up your apples into small wedges. 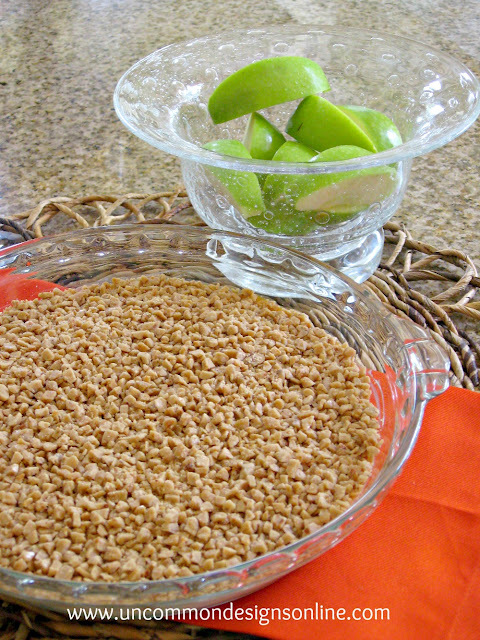 Granny Smith apples are our favorite because we love the crunchy tart flavor with the sweet dip! I also love using my apple corer and slicer, it really makes snacking on apples a breeze! One of the best things about this recipe is that you can actually purchase the ingredients to make it on the way to your event and then quickly put it together once you are there. Simple 4 Ingredient Recipe, Perfect for Parties! Sprinkle the toffee bits all over the top of the caramel. Slice up your apples into small wedges. Granny Smith apples are our favorite because we love the crunchy tart flavor with the sweet dip! oh my!! looks lish. gonna definitely add to my go to recipes. Miss you guys! Wow, this looks really amazing! Perfect for the upcoming season change! This looks so good! Pinning this for the fall! Stopping by to say hello from the blog hop! This looks wonderful! Heath is on of my favorite candies. I always get it in blizzards. Love it since a child. I will have to make this soon!! Here from the hop. Couldn’t resist checking out this recipe as we head into apple season. Will try this for sure. Wow…this looks and sounds DELICIOUS and YUMMY!! Mmmm, nothing says FALL more than Apples and Caramel – thanks for sharing! can’t find the carmel dip…could i melt carmels do u think?